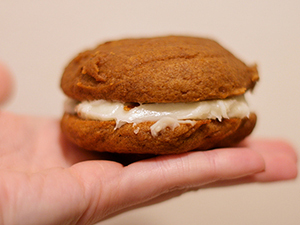 The founders of Baked in Brooklyn's Red Hook neighborhood created their own version of the whoopie pie. Instead of a bland cream filling, the bakers created a chilled cream cheese filling sandwiched between two cakelike cookies. For operational ease, the bakery uses a melon baller to scoop the dough. 1. Preheat oven to 350 F. Line two baking sheets with parchment paper. 2. Prepare cookies: In large bowl, whisk flour, salt, baking powder, baking soda, cinnamon, ginger and cloves until mixed; set aside. 3. In another bowl, whisk brown sugar and oil until combined. Add pumpkin puree and whisk to thoroughly combine. Add eggs and vanilla; whisk to combine. 4. Sprinkle flour mixture over pumpkin mixture; whisk to combine. With small ice cream scoop, drop heaping tablespoons of dough onto prepared baking sheets, about 1 inch apart. Bake 10 to 12 minutes, until cookies are just starting to crack on top and toothpick inserted in center comes out clean. Remove from oven and let cool completely in pan. 5. Meanwhile, prepare filling: Sift confectioners’ sugar into medium bowl; set aside. 6. In bowl of electric mixer fitted with paddle attachment, beat butter until completely smooth. Add cream cheese; beat until well blended. 8. Turn half the cooled cookies upside down, with flat side facing up. With tablespoon, drop a large dollop of cream cheese filling on flat side of each cookie. Place another cookie, flat side down, on top of filling. Press down slightly so that filling spreads to edges of cookie. Repeat until all cookies are used. 9. Refrigerate whoopee pies about 30 minutes to firm up before serving.